The Fabulous Faust Fan-Zine - ZineWiki - the history and culture of zines, independent media and the small press. 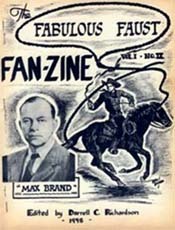 The Fabulous Faust Fan-Zine was a fanzine edited and published by Darrell C. Richardson. The first issue appeared in June 1948 from Covington, Kentucky, U.S.A. Four issues were released, all dealing with the life and works of author Frederick Faust who wrote pulp fiction novels and stories under such pseudonyms as Max Brand, George Owen Baxter, Evan Evans, George Challis, John Frederick, David Manning, Peter Henry Moreland and several others. His work included Destry, the basis for the 1940's film Destry Rides Again, starring Marlene Dietrich and James Stewart; and Dr. Kildare, upon which movies and television shows were based. It was a 64-page illustrated zine with fiction, articles, verse and many special features. The last issue appeared in December 1952. The cover art for all issues was done by William F. Nolan (Rhodomagnetic Digest). Illustrations were by Haskell Richardson. 1 No. 1 June 1948: Featured were short stories and poetry by Faust, and contributions from John Blair, Carl Brandt, Chester D. Cuthbert, Jack Delaney, S. Allen McElfresh, Darrell Le Fever, McElfresh, William F. Nolan, Haskell Richardson, Philip Richman, and others. Vol. 1 No. 2 December 1948: contributors included Carl Brandt, Chester D. Cuthbert, Steve Fisher, S.A. McElfresh, Coleman Nipper, William F. Nolan, Philip Richmond, Hebert Wadopian, and others. Vol. 1 No. 3 January 1950: Contributors included John Blair, Bill Clark, Chester D. Cuthbert, Frank Hartl, John K. Hutchens, Gilbert McLennan, William F. Nolan, J.L. Schoolcraft, Charles W. Wolfe, and others. This issue included the first printing of a long autobiographical letter Frederick Faust wrote to Jane Faust. Vol. 2 No. 1 December 1952 - Contributors included Cleve Cartmill, L. Ron Hubbard, Vida Jameson, William F. Nolan, and Samuel Peeples. Letters came from John Blair, Ray Bradbury (Futuria Fantasia), Carl Brandt, Jane Faust Easton, Steve Fisher, R, Pinckney McLean, Gilbert J. McLennan, William F. Nolan, Frank O'Rourke, and John L. Schoolcraft. This was William F. Nolan's first published work. This page was last modified on 8 August 2016, at 10:04.